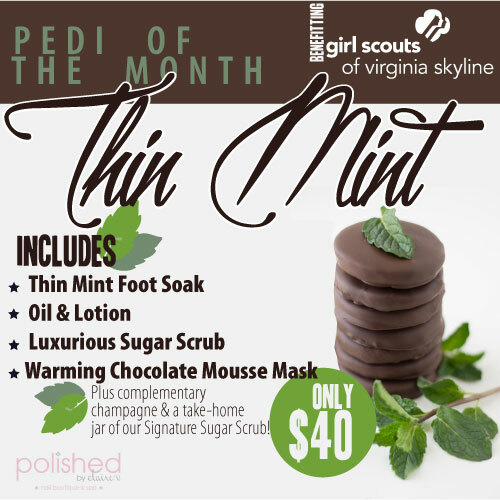 Our March Pedi of the Month is benefiting The Girl Scouts of Virginia Skyline. They were founded in March 1912 by Juliette Gordon Low. When she brought that first group of girls together in Savannah, Georgia, she wanted them to explore new possibilities and the wonders of the world around them—and she wanted them to do it together. Since the founding of the Girl Scout Movement more than a century ago, Daisy’s small circle of girls has grown to include nearly 2 million girl members and more than 50 million Girl Scout alums—united across the decades by a spirit of lifelong friendship and shared adventure and the desire to do big things to make the world a better place. To learn more about the Girl Scouts and the Virginia Skyline Chapter Click Here.